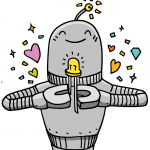 Give the Gift of Robots! Need a unique gift idea? Are your relatives asking for gift ideas for your child? 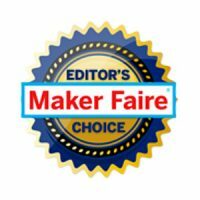 The answer is simple – a Robot Foundry class! It’s fun, it’s educational and it doesn’t take up any space! Purchase a specific class: Help your relatives out by suggesting a specific one-time class or two for your child. Or purchase a class for your child’s friend, so they can attend together. Classes are available through March at all of our locations and we keep adding more! Head here for registration and detailed purchasing instructions. Purchase a gift certificate: Not sure which class to pick? 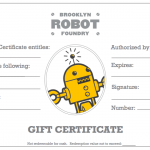 Gift certificates can be purchased for any type of class or in any monetary amount. We offer a range of classes for children 18mos – 10 years old. And we’ll be announcing our adult classes soon too! Click here to purchase a gift certificate.